Your gas furnace is going to turn on soon and settle in for another winter of warming your home. You want to make sure the furnace not only runs reliably, but also runs safely. Below we’ve listed a few tips that will help your family relax and enjoy a safe winter with a natural gas furnace in Fresno, CA. You’ve probably heard that carbon monoxide is colorless, tasteless, and odorless, making it difficult to detect. However, natural gas manufacturers place a chemical called mercaptan into the gas to give it a distinct—and unpleasant—smell. Mercaptan is harmless, but it smells like rotten eggs—a smell most people associate with sulfur. If you notice this smell in your home, you may have a dangerous gas leak. Don’t wait to find out if it’s from the furnace or not! Leave your house right away, and don’t attempt to call for help while still inside. What’s at Risk if I Try to Install a Furnace on My Own? We understand that many people in the Central Valley have strong “do-it-yourself” drives when it comes to home improvements and repairs. However, if the home improvement that you need to undertake is installing a new gas furnace, you absolutely do not want to tackle the job on your own, or even hand it over to a team of amateurs. There are some very good reasons that furnace installation is a job for professionals and professionals only. It’s easy to locate experts in home heating in Fresno who can install a new furnace for your home: call Purl’s Sheet Metal & Air Conditioning today and speak to one of our team, and we will help schedule a new installation that will give your household many years of warmth. The most important reason you should leave furnace installation to the professionals is that attempting the job yourself can be flat-out dangerous. Gas-powered furnaces connect to the gas main that enters your house, and trying to work on this line can expose you to toxic and combustible gases. In many jurisdictions, it is illegal for anyone except a licensed professional to work on any appliance connected to the gas main. Most furnace manufacturers also require that only professionals handle the installation job. Don’t take any risks of fires or exposing your family to carbon monoxide. Aside from the potential physical dangers of DIY furnace installation, the necessary work is simply too precise and requires too much special equipment for anyone to handle it correctly unless they have years of training and access to high-end tools. Custom-cutting for the gas pipes alone is a technical skill that goes beyond do-it-yourself tactics. If you are planning to install a higher efficiency furnace for your home, modifications to the ductwork are often necessary, and this needs professionals to handle; trying this on your own could deliver you a furnace that doesn’t vent correctly or fails to distribute air to the rooms. So leave aside any ambitions about installing a furnace yourself. The risks are too high. Professionals will handle the installation correctly so that the new gas furnace works as it should and will continue to do so for many years. And they will do the job in only a fraction of the time it might take amateurs. Purl’s Sheet Metal & Air Conditioning has served the community since 1952. We are headquartered in Madera, CA, which Forbes recently listed as one of America’s Booming Small Cities for 2014, with a job growth of 25% over the last fourteen years and a personal income growth of 22%. We are proud to be part of Madera’s continuing expansion, as well as providing services for excellent cooling and heating to Fresno and other surrounding areas. Posted in Heating | Comments Off on What’s at Risk if I Try to Install a Furnace on My Own? Modern gas furnaces use an ignition system to start up, a more complicated but safer way than the old-fashioned use of matches. When your thermostat sends the signal to the furnace cabinet that it’s time to burn the natural gas that will generate heat, the ignition system lights up the burners. There are a number of different ignition systems you’ll find in furnaces today. Older ones have pilot lights, while newer ones use electronic igniters such as intermittent pilot lights or hot-surface igniters. We’ll look over these three in this post. If you need repairs on your furnace or any other heating system in Fresno, call on the company that’s helped the Central Valley stay both hot and cool since 1952: Purl’s Sheet Metal & Air Conditioning. Pilot lights: Also known as “standing pilot lights,” these have been in use almost as long as natural gas furnaces have existed. (In fact, the term “pilot light” goes back to colonial times and referred to a flame kept burning to restart a wood fire in a hearth.) 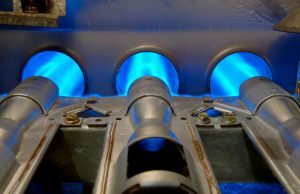 During heating season, the pilot light burns using the fuel from the main gas line. When the thermostat signals for heat, a gas valve opens and sends gas to the burner, where the heat from the pilot light ignites the gas jets. Intermittent pilot lights: Because pilot lights use energy as they burn, a more efficient system was developed where the pilot light would only come on when necessary. An intermittent pilot light uses an electrical spark to turn on the pilot light when it’s necessary to ignite the burner. When the burner turns off, it also turns off the pilot until it’s needed again. Hot-surface igniters: These are now the most common ignition systems in furnaces, and allow for superior efficiency ratings in recent models. Hot-surface igniters do not need pilot lights at all; instead, they use a silicon nitride or silicon carbide surface that heats up as current passes through it, much like the filament of a light bulb. When the surface becomes hot enough, it ignites the burners. These electronic igniters need to be replaced every few years; usually technicians take care of this job during regular maintenance. Speaking of maintenance… your furnace needs to have an inspection and tune-up once a year from an HVAC professional. With the Ultimate Service Agreement from Purl’s Sheet Metal & Air Conditioning, you’ll have two seasonal tune-ups each year (one for your heating, the other for your AC) as well as other benefits. Treat your Fresno, CA heating system well: call Purl’s Sheet Metal & Air Conditioning for repairs and maintenance.